Dan Sagraves | Anna & the Consequences… because there always are! 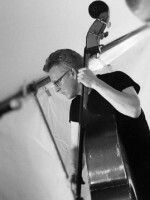 Joining a band is the modern day equivalent of running off with the circus, which is what Dan Sagraves really wanted to do before buying an upright bass in 1989. The comparison proved accurate as he traveled all over the Midwest with Columbus’ Flyin’ Saucers for many years. In 1998 Dan left to spend some time in Austin, Texas playing with Roger Wallace, Marti Brom, numerous singer-songwriters, swing bands, and in honky tonks. The music scene in Austin awoke a lifelong love of being a “hired gun” on bass. Upon returning to Columbus, Dan studied with the legendary Cornel Wiley, worked with spontaneous bandleader Chief Johnny Lonesome, road tripped with “The Human Jukebox” Sleepy Labeef, played for a few years with “The Man of a Thousand Songs” Pete Shew, and spent a life-changing ten years with Columbus’ own Ray Fuller and the Bluesrockers, among too many other great projects to count. Rhythmically, he has had the luxury of working with the best drummers central Ohio is blessed with, but is just as comfortable pulling out all the stops and slapping out a great beat on his own axe. *Anna & the Consequences are thrilled to have this original member back in the line-up!